Built NY Laptop Sleeve 17"
The idea for this product was born when a Built customer-desperate to create a laptop sleeve of his own-ripped out the middle seam of the Built two bottle tote. Composed of extra-thick durable neoprene, it cushions and protects your laptop for maximum protection and safely slides in and out of your briefcase or luggage with ease. Perfect for business travelers and urban nomads alike. Best of all, slide it in and as it conforms to the size of your computer, its unique bone shape creates an instant built-in bumper system for extra protection. Its Shark Gill Grips on the sides makes gripping and handling slip-free. My only concern was if it would fit my 17" MacBook Pro. It fits perfectly so put your mind at ease if that is your question. Beware if you have a widescreen 17"
I bought my sleeve in order to turn my favorite "messenger bag" into an optional computer carrier (for bike commuting). It works great for that, as would wadded-up newspaper, a towel, or a large serving of popcorn, as padding is the key. This provides that. What I discovered is that a padded sleeve this one provides the best way to transport your machine when a full blown laptop bag is too much. 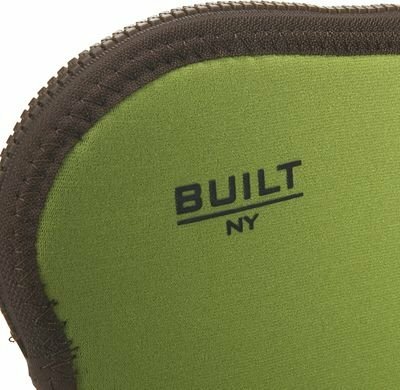 Relying on a fully charged battery, I have used my excellent Built NY sleeve to take my laptop along on flights, and I do so with confidence in the security of the machine (and going through security is a BREEZE without having to dig the computer out of a bag). One warning: make sure the computer is completely off and not just snoozing, because this is essentially an artic sleeping bag and you'll probably overheat the computer quickly if it is stored with the power on.